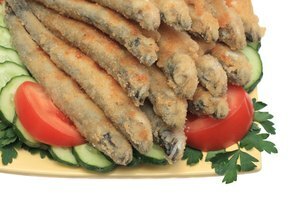 Crunchy cornmeal and succulent fish – what's not to like? What's even better, no matter what kind of fish you choose, you'll get a healthy dose of heart-healthy omega-3 fats that can lower your blood pressure and reduce your risk of stroke. Studies aren't definitive, but fish oils may also decrease depression and dementia and may prevent inflammation and the risk of arthritis. 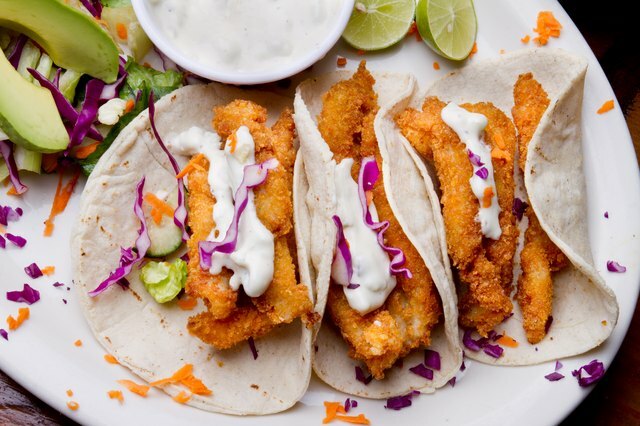 Because deep frying transforms a healthy fish dinner into one with an unhealthy level of fat, it makes most sense to use a skillet and pan-fry the fish. All fish are not created equal when it comes to pan-frying. Some are too delicate and flaky to stand up to the treatment while others with sturdy flesh do just fine. Fish with solid flesh include salmon, bass, halibut, cod, Arctic char, tuna, tilapia, catfish and shrimp. That said, you can minimize damage to tender fish, such as a trout fillet, by pan-frying it on only one side, with the skin side down and eating the crunchy, corn-meal crusted skin. For tender fish, cover the frying pan so the middle and top of the fish cook, too. Some tender shellfish, such as oysters or clams, do fine with frying on both sides. Especially with mild fish, you will want to season both the flesh and the cornmeal to make the most flavorful dish. Lightly salt and pepper the fish on both sides. 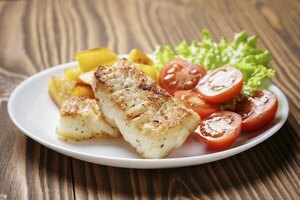 Keep each fillet whole or cut the fish into portion sizes or fish sticks. For the cornmeal, add 1 tablespoon of seasoning, such as smoked paprika, herb blend or Parmesan cheese, to each 1/3-cup of corn meal. Stir the ingredients together thoroughly. Place the cornmeal on one plate, flour on another plate (use about 1/2-cup of flour for every four fillets) and separate two large egg whites into a small bowl. Use healthy whole wheat flour if you have it. The flour and egg whites help the corn meal adhere to the fish. 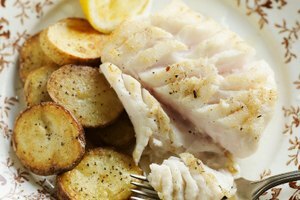 Cooking takes only a few minutes for most fish, so save this step after your side dishes are all ready to go. Heat a heavy skillet to medium and add 2 to 3 tablespoons of olive oil to help ensure the fish won't stick to the pan (the olive oil also provides heart-healthy fats). Then, dredge the fish in flour to dry it out, shaking off any excess. Next, dip the fish into the egg whites, and let any excess fall off. Finally lay the fish in the corn meal and pat the grain gently all over the fish. Heat the pan to medium, and cook the fish for 3 to 5 minutes on each side depending on the thickness of the fillet. You'll know it's done when it flakes easily when you pry it apart gently with a knife. Even though they have the same healthy benefits of all fish, certain types contain unsafe levels of mercury. 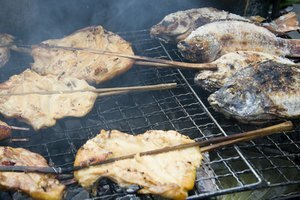 The U.S. Food and Drug Administration recommends that pregnant women and children avoid some fish altogether, including swordfish, shark, king mackerel, Gulf tilefish, marlin and orange roughy. They also recommend eating no more than one serving per week of tuna, canned or fresh, Chilean sea bass, halibut, sablefish and snapper, among others.